Whether you’re opening a coffee shop or simply looking to expand your beverage menu in your restaurant, choosing the right coffee equipment for the job can make a world of difference. Glass: Purists argue that glass makes for purer-tasting coffee. Stainless Steel: While more durable, these may be harder to clean. Polycarbonate: Thermoplastic carafes are both lightweight and nearly unbreakable but are less attractive for restaurants looking to serve the ‘experience’ with the coffee. Output: 536-840 oz per hour. These machines can dispense a variety of flavors with no brewing involved because the product is created from powdered mixes. Best for catering banquet, halls buffets, hotel, lobbies, cafeterias and gas stations. Output: 176 - 552 oz. per hour. 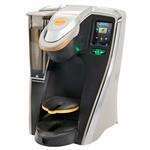 These can brew, hold, and serve coffee all from one machine and are best suited for medium-light traffic areas. Best for Catering, restaurants, offices, schools, and hospitals. Output: 80 - 2416 oz. per hour. These brewers brew coffee into airports or other storage containers like airports, brewers, and servers. Best for catering, banquet halls, cafeterias, buffets, restaurants. Output: 320-1920 oz per hour. Water automatically refills, and some models come with a pourover design as well. Best for break rooms, diners, coffee shops, gas stations. As a high-volume version of the standard coffee machine urn, these quickly brew for hundreds and are best suited for large operations. Best for catering, buffets, cafeterias, diners. Output: 240 - 720 4 oz. demitasse cups per hour. 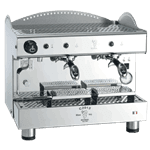 These machines can brew cappuccino or espresso and are essential for fresh lattes and other espresso-based coffee drinks. 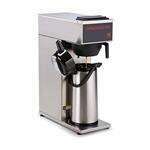 Best for coffee shops, sandwich shops, restaurants. Manual: with a hand-operated lever, these styles require more staff training than automated machines but are preferred by old-style and traditional baristas. Semi-Automatic: requires the operator to stop the length of the espresso 'pour' manually. This can be via an electric pump or older 'hydraulic' delivery method. Automatic: the machine does most of the work, from measuring the length of the pour to stopping the machine when the espresso is ready. Duration is controlled by the ‘brain’ and a water metering system. Super-Automatic: the machine does ALL of the work from grinding to packing and brewing the pots. In 1-step machines, frothed or heated milk is added directly into the cup. Machines, where the barista froths the milk and then combines with the coffee portion, are called 2-step machines. Group Heads: this is the number of pots that can be connected to the machine at any given time, allowing for more espresso pots to be brewed simultaneously. Boiler Size: ranging from 1.8-5 liters in 1 group machines, 5-12 liters in 2 group machines, 11-18 liters in 3 group machines, and 20-22 liters in most four group machines. Larger drinks that consume more water like 16 oz grande and 20 oz venti sizes require more performance from your machine and bigger boiler sizes while restaurants serving 6 and 8 oz single cappuccinos can opt for smaller sizes. Electrical Draw: this is known as the element rating and can affect the recovery time of your machine. Higher capacity machines are suited best for larger operations with a big morning or lunch rush or that use the machines for Americanos, Crema Coffee, and tea. Desired Volume Output: how much does your establishment need to produce in any given day? You can find volume outputs in the specs of each of our machines, and it’s typically labeled in cups per hour. But keep in mind that larger events like catering situations or cafeterias will demand higher voltage machines to keep up with the higher volumes. Setup: is your business outfitted correctly for the voltage you desire? 120-volt units can often be plugged into a common wall outlet, but other voltages like 208 and 240-volt machines may require a different outlet formation. Qualified electricians will be needed for specific hard-wiring tasks for amperage and phases as well, so check individual product spec sheets for this specific information. Forward slash (such as 120/208): These must be hooked up to both voltages. Hyphenated (such as 120/208-240): These can be run on either of the hyphen-separated voltages. If your machine doesn’t come equipped with an automatic grinder, then you’ll want to invest in a separate grinder so that you can purchase beans in whole form rather than pre-ground (which can taste stale quickly). Purchase additional grinders so that you can have different flavors ready for grinding at any given time. This is especially helpful for caffeinated and decaf beans. Airpot: if you’re limited to a single brewer but need to serve more customers during peak hours, coffee urns can hold the overflow at optimal temperatures for longer periods of time. Coffee Warmers: as a warming plate, you can place glass coffee pots on top of this warmer to keep coffee warm for short periods of time. Keep in mind that the longer you leave your coffee on a warmer, the more likely it is to taste stale and eventually burnt. While it may have taken time and effort to make espresso drinks in the past, newer machines with milk-frothers and multiple pots for brewing more than a single shot at a time have made catering to larger crowds a breeze. Warm it up. Before brewing, the machine and all its parts need to be warmed up. Every part that comes into contact with the coffee should be warm: the brew head of the machine, the coffee handle and portafilter, the cup, and even the tamper ideally! Grind quality matters. You need good, even, fine grind to produce good espresso. Purchase a high-quality espresso grinder, and ensure that you’re tamping your grinds the same every time, lest you end up with a wide variety of stronger or lighter coffee brews. Don’t forget about water quality! If the water is bad, the espresso will follow, so ensure that your water is filtered with a specialized filtration system. 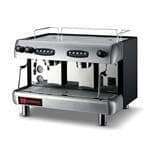 In fact, Grindmaster Cecilware, one of the top manufacturers of coffee equipment, will not warranty units without a filtration system due to their importance in retaining the function of your coffee equipment. Keep it clean. Before you brew your espresso shot, be sure to wipe off any excess grinds left on the rim of the portafilter, lest you push grinds up into the group head. Residual coffee in the handle, brew head -also called the group head -, shower screen (the screen screwed into the brew head), and anywhere else in the brew system will turn rancid quickly and taint every espresso you make! 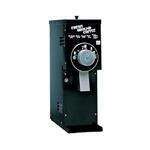 Some machines have a 3 Way Valve that releases pressure behind the brew head. These machines usually come with a Blank Filter - a portafilter that snaps into the coffee handle with no holes in it. That means you can put a little coffee cleaner (Cafiza) into it, put it into the brew head, turn on the machine for 30+ seconds, and backflush! If your machine has no 3 Way Valve, no worries. Just keep the coffee handle clean by soaking it in a Cafiza solution, and remove and clean the shower screen every week or two.